I was first elected to the RM of Morris Council in the fall of 1995. Working through the minor flood of 1996 and the more significant 1997 flood was a challenging introduction to the responsibilities of municipal council work. Some of council highlights for me have been the introduction of organized drain maintenance plan using modern laser surveys to ensure effectiveness. The rural potable water project was also very significant to all rural residents in the RM of Morris. About 95% of all homes in the RM of Morris have been serviced with water. I have served on a number of committees in my time on council. The Valley Regional Library, Red River Valley Health District Foundation, RRR Community Development Corporation, LUD of Rosenort, Valley Agricultural Society, and service on the Emergency Measures Committee are examples of some of my committee activities over the past 18 years. It has been my privilege to serve as director on the board of the Association of Manitoba Municipalities (AMM) for the past 5 years. This has given me the opportunity to develop an understanding of policy initiatives and appreciate the process and challenge of lobbying the Provincial and Federal Governments. Two years ago I retired from grain farming to devote more time to the new responsibilities of serving as Reeve for the Rural Municipality of Morris. I am married to Patti, and we share 5 children, and 3 grandchildren. It is a real pleasure to serve the residents and ratepayers of the RM of Morris. I grew up southwest of Lowe Farm, attended Kronsweide School, and graduated from Morris School in 1970. I have been farming for 44 years, starting off with my parents, and later with my wife Liz, and our children. In 2009 we moved to Lowe Farm and continued to farm for a few more years. We are now both retired from farming, and have started a small storage rental business in Lowe Farm. Community Service has always been an interest to me. 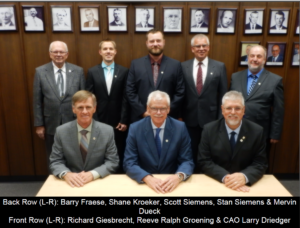 I have served on several boards, including the Lowe Farm Chamber of Commerce, the Lowe Farm Co-op, Lowe Farm Credit Union and the Manitoba Pool local sub district council. I have served as Treasure for the Lowe Farm Bergthaler Mennonite Church, and most recently Chair of the church. I am currently the Secretary Treasurer of the Living Grains Project (Lowe Farm/Kane Canadian Foodgrains Bank growing project). I married my wife Liz in 1975, and together we raised two children, now each have 2 children of their own. We enjoy attending their activities as well as some camping, motorcycling and going on vacations! Over the years, we have always enjoyed numerous sports including baseball, softball, hockey and curling. I also enjoy music, and sang in a gospel quartet for many years as well in the Prairie Chaff (Morris & area choir). I am serving my first term on Council, and I am looking forward to this new experience serving the entire municipality, and to contribute to the continued growth in the RM of Morris. I’ve been farming in the RM of Morris since 1979. I live on a River Lot East of the Red River in the RM of Morris. I have 2 children, Ashley and Tyler. I was first elected in 1995 to 2002 and again in 2006 until now. 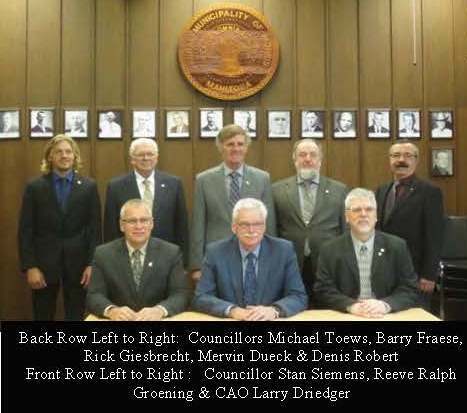 I serve on several committees and boards such as; Roads, Finance, Equipment and Building Committee, Morris CCD, Lower Red River Valley Water Commission and the Morris Manor Governing Board. I enjoy representing the RM and bringing issues and concerns to the table, and providing positive results to our residents. My wife Marion and I live in Rosenort and have 2 children, Rhonda (Reg.) Friesen and Steven (Danielle) Fraese. I have been involved with aviation for 35 years. I was first elected in 1998 and served on over 10 Committees. I presently serve on the Morris Handi Van Committee as Chairman on behalf of the RM of Morris. Born and raised on the farm, between Rosenort and Morris, in the area that was known as Trump Siding or just East of Riverside. Graduated from Rosenort School in 1980 and took over the family farm a few years after. Farmed there until last year when I retired from farming. I’m a veteran of 7 floods, learning to cope with it almost like a right of spring the last few years. Currently I still live on the farm with my wife Susan and 5 children. Having 5 children active in sports has given me opportunities to be involved with numerous communities and sporting organizations. This has allowed for numerous travel excursions, thereby enabling us to get to know various people across North America. This is my first term on council. 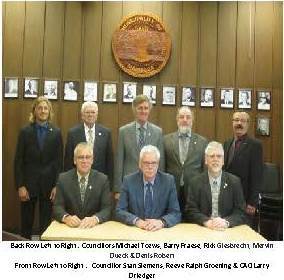 I’m involved in the Finance, Economic Development and Drainage Committee for the RM of Morris. I also represent on the Rosenort Community Centre District, Rosenort Chamber of Commerce, Rosemor Development, and Red River Basin Committee-South Chapter. I am enjoying representing and bringing issues to Council regarding flood issues as well as Rural and Urban issues. Shane Kroeker enjoyed growing up on a grain farm in Riverside, MB and played various sports while representing numerous local community teams based out of Rosenort, Morris, and Lowe Farm. The small-town, hardworking nature of life both on the farm fields as well as the baseball fields made a lasting impression. Shane graduated from the University of Manitoba’s Asper School of Business with a Bachelor of Commerce (Hons) program with a double major in Business Management, and Marketing. With degree in hand, Shane married Trishia Kroeker (nee Siemens), and they set roots in Rosenort, where they now have a young family with 2 children (Jet & Aria). Shane is currently working for K-Tec Earthmovers, as Vice President Marketing. Since 2011, Shane has volunteered on Rosenort & District Chamber of Commerce, and is currently the President of the non-profit organization that promotes business growth and economic development in our area. Shane got his first experience in public office after being elected to the LUD of Rosenort committee in 2014, and has served a 4-year term, focusing on improvement areas and incorporating tax-payer requests within Rosenort. Shane is now using his skills and abilities in the broader area of the Rural Municipality of Morris as Councillor. Shane strives to create more tangible value for stretching the tax dollars that are incoming from residential, commercial, and agriculture streams. Shane is interested in attracting new businesses to RM of Morris industrial parks and commercial zones to provide for more local amenities and job creation for the area. Sustainable growth and continuous improvement are two foundational pillars that have been important in Shane’s career. Growing up on a farm has taught me numerous invaluable items that have served me well in my personal life and also in my career. I have always enjoyed using a simple and common sense approach to tackling both simple and complex issues. This approach has served me well. Educational opportunities have allowed me to complete the Business Administration Program at Red River Community College. After entering the workforce, I have also had the privilege of being able to acquire an Advanced Certificate in Accounting from the University of Manitoba, along with numerous municipal related courses, graduating from the University of Manitoba with a Certified Manitoba Municipal Administrators Certificate. 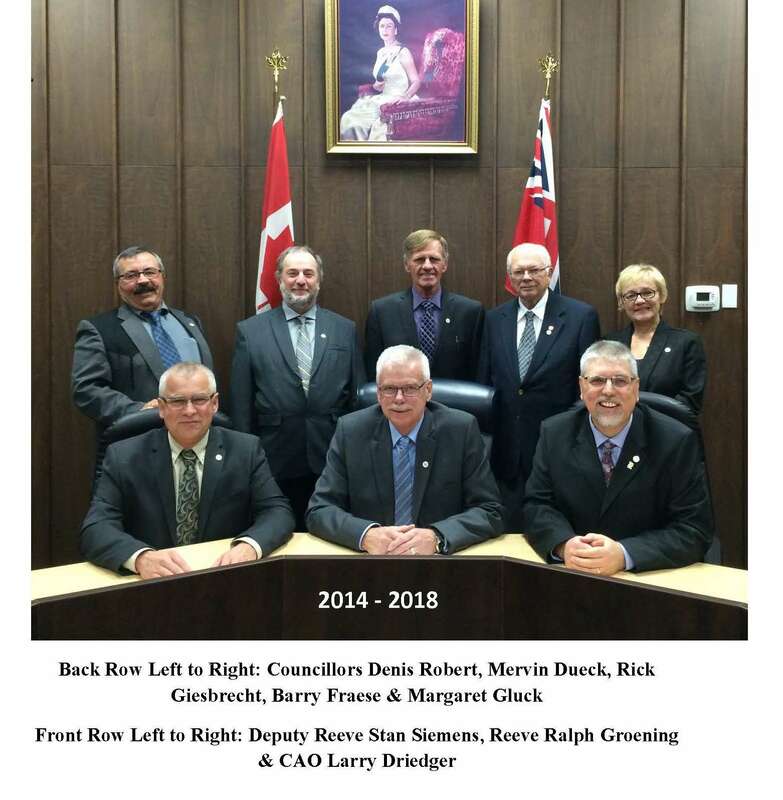 Having worked in an urban municipality for better than 23 years, and prior to that working in a school division office for 3+ years, has given me a broad perspective and a wide range of experiences that have led me to my current position here as the Chief Administrative Officer for the Rural Municipality of Morris. On the family front, my wife Barb and I have three adult children who have been a wonderful blessing to us. As a family we enjoy camping and travelling together. I also enjoy spending personal time in my woodworking shop creating various different projects over the years.